A reliable source for Modular Workbenches information and a resource for accessing leading Modular Workbenches and suppliers. A “module” is a standardized, often interchangeable component of a system or construction that is designed for easy assembly or flexible use. A modular workbench, then, is a workbench that a person can put together or take apart easily. Modular workbenches can be customized in many different ways. Standard questions a manufacturer might ask are about height, width and depth, the type of flooring on which the bench will be placed, material type of the bench, the expected weight supported and what purpose the customer plans for the workbench. Work benches may be made of steel. If so, another question will be, “Is the desired steel lightweight or heavyweight? If unknown, the next question should be, “What is its required capacity?” Modular workbenches can come equipped with wheels, and those wheels may be customized to have a locking mechanism. If a consumer is working in a humid place, a wooden workbench may be designed with standoffs. Standoffs allow for proper air circulation, which helps safeguard against the warping that wooden benches can suffer from seasonal heat and humidity changes. Also, bamboo work surfaces can come treated with UV-cured protective coating. 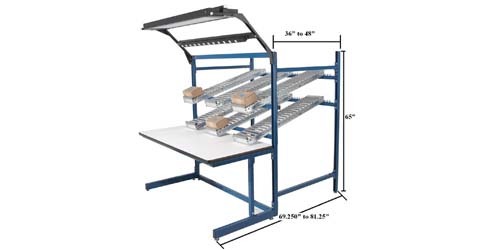 Modular Workbenches A "module" is a standardized, often interchangeable component of a system or construction that is designed for easy assembly or flexible use. A modular workbench, then, is a workbench that a person can put together or take apart easily. Modules include: single drawers, double drawers, single files, lockers, lockers with shelves, etcetera. Such modules often come equipped with optional casters. Some with the option to add overhead storage modules as well, such as sliding or flipper door overhead cabinets. 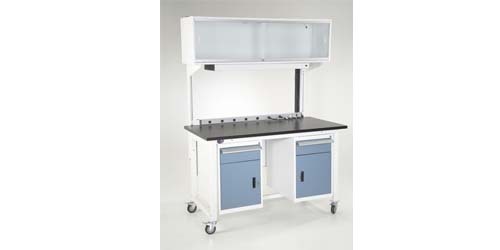 Many industrial workbenches even come with the option to add electrical, computer or lighting components. As demonstrated, modular workbenches, designed specifically for tight spaces and for versatility, are an excellent choice for any project. A small garage may not have room for a workbench that is always assembled. A modular workbench gets around this issue by being something a person can take apart and store on a shelf when it is not in use. A modular workbench is also portable, for the worker who isn't always in the same place. Modular workbenches work well for larger industrial jobs, because pieces can be added and removed when needed. They touch every industry, and can even be used for hobby projects at home.